Incorporated in 1924 as the Addressograph Securities Company (ASC), this company was formed to acquire the Illinois based Addressograph Company. In 1929 ASC changes its name into Addressograph International Corporation (AIC). The American Multigraph Company, formed in 1902, was acquired in 1930. 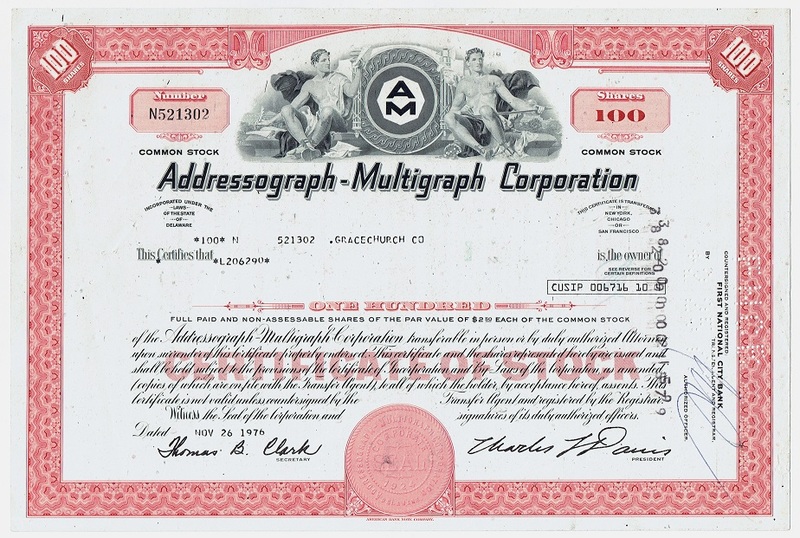 The next year AIC changed its name into Addressograph-Multigraph Corporation. Addressograph-Multigraph was involved in the manufacturing of mechanical and later electronic machines for typesetting, labeling, addressing, name embossing, office duplicating, facsimile printing, image scanning, magnetic tape recording, punched card and text processing. By the end of the 1950s the company ventured into the field of digital computing. In 1978 the company will change again its name, this time into Addressograph-Multigraph International (AM International). 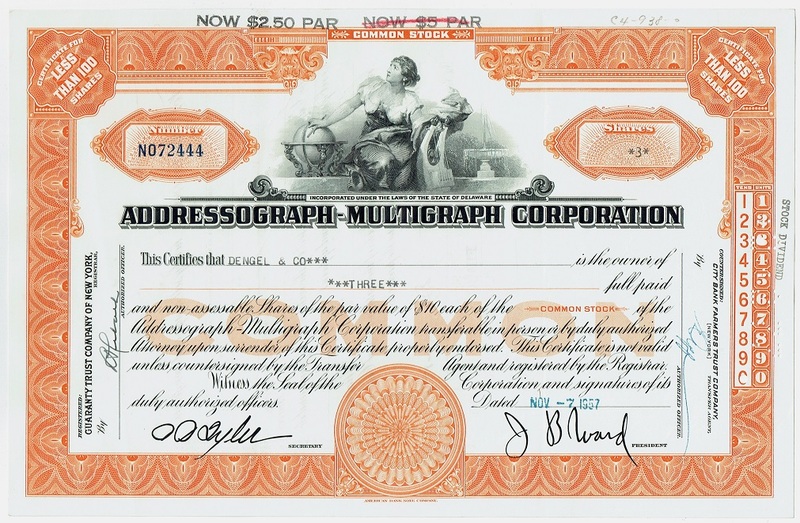 A stamp in the top margin shows that the stock value per share (par value) was reduced to $5 and later $2.50. 1961 AM introduces the AM 943 File Processor, a plugboard programmable general purpose computer consisting of 45,000 diodes and 15,000 transistors. The AM 943 uses magnetic tape as the storage medium. Each system is tailored to the users need utilizing standard modular components. Digitronics Corporation will manufacture AM's product. 1961 The AM 960 Printer Processor performs off-line printing. Its command repertoire permits editing of raw data and assembly programs can be run on the processor. The AM 960 has a 4,000 character magnetic core main memory and a 133 character magnetic core printer buffer. 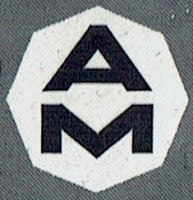 The vignette incorporates the AM logo which also appeared on their office equipment. 1975 AM introduces the Documentor System 3213, a microcomputer based counter-top system. Its software package can be adapted to any restaurant application. The system consists of a master unit and up to four optional remote slaves. The 3215 model system is designed to operate with automatic bar dispensers. Model 3214 is operated as a standalone unit. The Documentor systems are designed for multi-purpose accounting functions such as itemized customer receipt, calculation and storage, reporting, transaction display and cash drawer control.